Last Friday’s terror attacks in peaceful and sustainable Norway shocked the whole world. The 32 year old terrorist Anders Behring Breivik immersed the whole country into the nightmare which took away 76 lives, including teenagers participating in the Labour Party youth camp on Utoya Island. 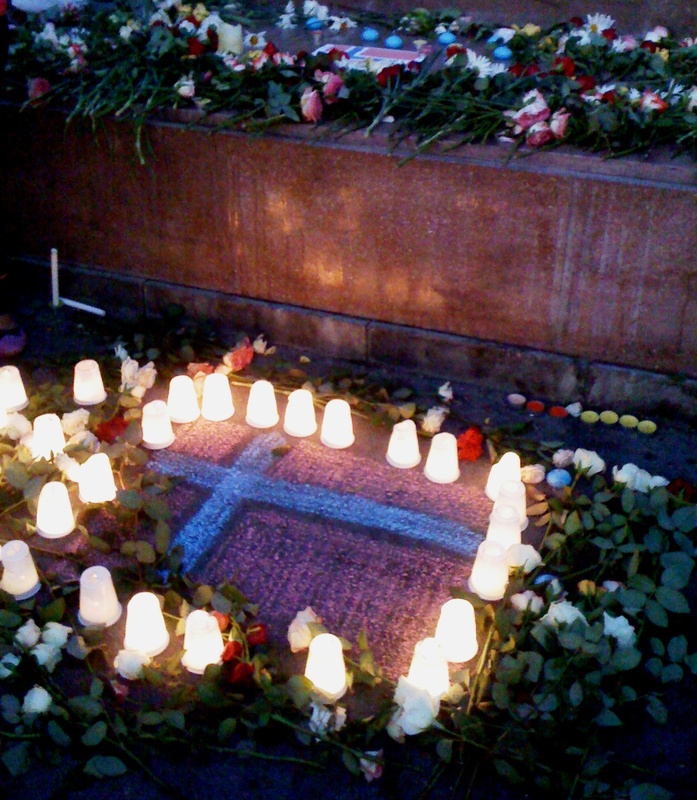 To commemorate the victims of this inhuman cruelty and to show their support to the Norwegians, people in Yerevan are coming to the Freedom Square to put the flowers and lighten the candles. Judging from the way Breivik talks about his own actions and motivation it seems to be pretty obvious that he is not insane. He even recognized his actions rather cruel, but at the same time named them necessary and inevitable. His manifest “2083—A European Declaration of Independence” reflects on a number of absolutely real historical events (including 1915 Armenian Genocide committed by the Ottoman Empire) and has the proper references to the authors he cites. Besides, the open fight between Islam and the West, the frequent radicalization of the former and the reaction of the latter is not something new for the world. So the terrorist did not probably say something new or totally incomprehensible, but the way he chose to deliver his beliefs introduces him as an absolutely sick person. You know, I think I just want to believe that only a sick one could do that, otherwise the concept of “healthiness” would loose any sense to me. Yes, everyone has a right to have an own approach to the interpretation and evaluation of the politics, global history, the clash of civilizations or whatever else. But, everyone is also obliged to take legal and moral responsibility for anything going into the public (whether it is an analytical publication, blog post, public speech or a 1,500 pages manifesto). Today there is a huge threat that if hundreds of thousands condemned the terrorist, there still might be one who can get attracted to his ideas and follow him. Yes, for achieving the goal one has to be ready to do a lot of things. But the goal does not always justify the means. As a very good friend of mine Tigran mentioned yesterday, intelligence, purposefulness, commitment to the idea, courage and many other features of a strong personality are nothing unless they serve a humane goal and only through the humane means. I would say they are nothing good, since their presence without an underlying humaneness can easily lead to such well-known cases as Stalin’s 1930s repressions, Hitler’s fascism, Pinochet’s 20-year-long curfew, etc. The statement posted apparently by Breivik via Twitter a couple of days before the attack that “one person with a belief is equal to the force of 100,000 who have only interests” is actually very true. But having on the one scale non-violent examples of Mohandas Gandhi, Martin Luther King and many others, the history also bears the opposite scale which unfortunately has been recently “enriched”. Getting back to my initial point, it is of an utmost importance to make sure that our beliefs are going along with the humane values; and our goals (whatever they are about) are implemented through the humane means. Because there is only one real value in a real world and that is a human life. And there is simply no justification for anyone whose actions contradict this value. Said well. I met some fellow youngsters, Norwegians. They all knew someone who died in the attack. Besides the sorrow and the pain, one of them said the most important thought: that with this action, Breivik did not change the beliefs of the society and the Nation, but made the existing ones even stronger. I hope that the model of Norway will prevail in the situations where instead of opening up- closing is the answer. this is actually a very good point Zsuzsi, köszönöm!